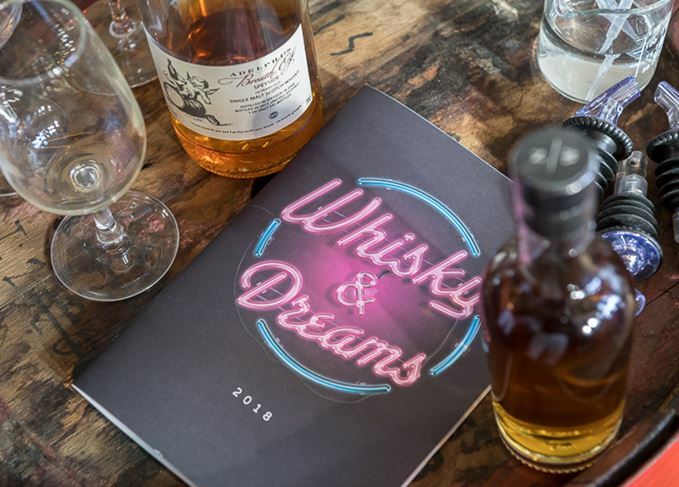 Deliberately skewed toward emphasising independent distillers and bottlers from around the world, Melbourne’s Whisky & Dreams is a refreshing alternative on the whisky show circuit, writes Dave Broom. Whisky is hot in Melbourne, but this was taking things slightly too literally. As the first sessions of 2018’s Whisky & Dreams started, the mercury was rising into the high 30s (that’s well above 90˚F for our American readers). Given that the event was within Starward’s glass-fronted, working distillery and there were 500 people attending each of the four sessions, things got even hotter pretty quickly. This was the second Whisky & Dreams run by importer Baranow’s Emporium in the past seven months, this iteration having been brought forward in order to dovetail with Christchurch’s DramFest, thereby allowing some international visitors to attend both. For a ridiculously low A$65, guests also got a free glass, ‘because they’d just steal it anyway’, a voucher for one of the two food trucks stationed outside, and most importantly a chance to try whiskies (and gin and rum) from a spread of countries; while Scotland dominated, there were also drams from Brittany, Japan, Italy, Kentucky, Ireland. Australia was also well represented through Nip of Courage, which represents many of the country’s growing number of artisan distillers. The remarkable Tin Shed distillery was also there and, naturally, Starward itself. As well as Gordon & MacPhail, Berry Bros and Adelphi, there was a high level of representation from less commonly spotted independent bottlers, such as Asta Morris, Rest & Be Thankful and North Star Spirits, and specialist Australian agencies Casa do Vinos and Indie Whisky (the import arm of Whisky & Alement, the Melbourne bar which kick-started the current boom). It all added up to 140 bottles for folks to try. Instead of tables, the whiskies (and gins and rums) on show were on barrels dotted around Starward’s huge bar space. Pours were, sensibly, small at 5ml, allowing for greater ability to sample, though more spittoons and dump buckets/rinse stations might have come in handy. It was only after an initial wander around the rapidly filling space that you realised there were none of the majors represented – only Bladnoch, Kilchoman and Ardnamurchan were flying the Scotch distilleries’ flag. The focus on independents is deliberate, and appreciated. ‘It gives me the chance to try new things,’ said one attendee. ‘This is the stuff you rarely see in the stores,’ said another. There were three classes on both days, each lasting 90 minutes: one a reconstruction, by Adelphi’s Alex Bruce and Starward’s founder David Vitale, of ‘The Brisbane’, the latest addition to the former’s Fusion range – this time a blend of Scotch and Australian whiskies, specifically Glen Garioch ‘teaspooned’ with Glen Grant, and three casks of Starward. The other sessions used four whiskies (two Scotches, Puni’s ‘Sole’ and Tin Shed’s ‘Iniquity’) as springboards to chat about all things whisky with host Charles MacLean (assisted by yours truly). An hour and a half is long for the standard class, especially with ‘only’ four drams on show, but this is not a show which plays to convention. The discussions – which were pretty much led by the attendees – allowed wide-ranging conversations to take place, which could touch on smoking and phenols, the role that wizards played in whisky’s creation, the state of the Aussie industry, the importance of location and food culture to whisky’s evolution, and how an Italian drug dealer helped to establish Scotch in that country. Not your standard fare, perhaps, but by the end of the first session it was apparent that this was a show which deliberately works outside the normal conventions and welcomes conversation. Australia’s rekindled interest in all things whisky is being driven by 25- to 35-year-olds, which explains the significantly younger demographic at the event and the significantly higher percentage of women. The boom shows no sign of slowing, which also means that the knowledge levels vary widely, from super-nerds at one end to complete newcomers at the other. That in turn meant that Baranows had to set a tone for the show, which cannot be intimidating. Inclusivity is the key to whisky’s future success. The folks behind the barrels – brand owners like North Star’s Iain Croucher, representatives like Kilchoman’s Nicole Lindsay, or Berry Bros’s Luigi Barzini, had been nimble enough to shift from geekdom to conceivably answering a nervous newbie’s first-ever question about whisky. The very different range of exhibitors also allowed people’s idea of what whisky is (and could be) begin to expand. As the final Sunday session winds down, I grab a quick – and extremely refreshing – Starward Wine Cask and tonic at the bar with Baranow’s John Raphael. ‘We don’t want this to be a mirror of Whisky Live,’ he says. ‘We know that there is no whisky industry without the big firms, but most of the people who are coming through that door are discoverers. Dave Broom finds much to celebrate in the diverse whiskies of Australia and New Zealand. Australia has close links to Scotch whisky, stretching as far back as the mid-19th century.